Summary: Have you ever thought of travelling with your balance scooter on holidays ?Many people may ask why i have to travel with a balance scooter ? Well, let me tell you why.Absolutely more cool than stay at home. Whether it is the weekend, or holidays, for the leisure time, how do you spend it? In fact,rather than stay at home, it is better to go out and travel with your balance scooter, as long as you like, you will find that your holidays can be full of passion. A traveling usually without a fixed destination, and do not know the next destination, which means that it is difficult to ensure a specific way for travel, Even so,balance scooter is still able to accompany your . Most balance scooters are very small and portable, even you need to take a train or vessel,you can also carry it around, do not need special consignment or parking, very convenient. As balance scooters are powered by battery, so it is very easy to ride up, allowing you to have enough energy to engaged in the beauty and delicious food along the way. Normally a balance scooter speed is among 8-20km per hour, although not as fast as a car, but it is a speed most suitable for ride travelling,ensures enough time for rider to enjoy everything. Travelling takes time, if there is no time then nothing will happen, many people may think so. But for the balance scooter, as long as there are several minutes left,you can be happy with it. A smart shape allows the balance scooter to ride in any narrow space, even at home. And, it will not produce any noise while riding, therefore will not affect other people anywhere. Do you want to try travelling with balance scooter now? If you can invite family members or friends, there will be a greater bonus, you will be even more happier. What is the hoverboard price at the end of 2016 ? With the development of economy, the number of cars is increasing. The frequent traffic congestion affect a lot to people who need travelling. Hoverboard can be used as a very useful means of transportation. It can convenient used in the tree-lined path or on the road, and you can even take exercise while riding a hoverboard . Now you can see variety of balancing hoverboard on the market now. How much is a two wheel balanced hoverboard? This is perhaps our most concern, the price is a key factor affecting the cost effectivity. Two wheels balanced hoverboard products with so many styles from China manufacturer, many manufacturers are aimed at this market, the price ranging from 60$ to 800$, it is very difficult to distinguish between true and false. Balancing hoverboards has many benefits indeed, it plays a great role in promoting healthy life, a lot of brand name balance hoverboard really expensive, since its performance is very good, good after sale service. A product want to survive must adapt to the market, not only the market demand, but also concordant with the consumption level. Although the balancing hoverboard ( initial know as Segway scooter ) into the market has been more than a decade, its sales rising smoothly and it booms in 2015 because many Chinese manufacturer enter into this market and its price has been dropped , it is estimated to have been sold out for more then 100 million, well, it is a amazing number. However, a lot of firing and explosion problem occured. So Amazon ban hoverboard on 12th Dec,2015 and many countries take strict inspection for these hoverboards. However, several manufactures has applying for UL certificate of hoverboard, manufacturing in accordance with UL2272 standards too, so it is more safer than ever. Usually, a wholly UL2272 approved 6.5 inch self balance scooter cost for more than 120$/piece , TUV approved 6.5 inch self balance scooter cost for more than 100$/piece, based on bulk order quantity and shipping cost was not included. If someone claimed to provide hoverboards to you below this price, you should consider about it carefully. If you want to know price about other hoverboards, you can leave comments below this post, i will try my best to help you. Author AdministratorPosted on October 1, 2016 Categories BlogsTags 6.5 inch hoverboard cost, balancing scooter price, hoverboard price, hoverboard price 2016, how much does a hoverboard cost, self balance scooter price, smart balance wheel price, TUV hoverboard price, two wheels hoverboard price, UL2272 hoverboard priceLeave a comment on What is the hoverboard price at the end of 2016 ? Above balance scooter statistics were collected from user, aimed to provide foreign buyer a better understanding of the electric balance scooter industry. This information is for reference only, do not mean that we recommend the purchase;the statistics above were not ranking in particular only,and we sincerely welcome your comments and suggestions. If you are a importer or distributor, you would know that the ordering season is coming as only two months left for Christmas holidays. So the sourcing time for supplier and bargaining time with supplier is coming too. As a experienced purchaser or business owner , you should know that most goods come from China, India and Vietnam , to get the most cost effective goods, you must looking for in China. Although since Alibaba.com became very popular, it is a lot easier to find new products, no need to visit fairs every time.However,there are many small factories and several bad supplier selling ultra low price with no warranty products. Getting these kind of products, you will suffer from a disaster soon. If you have a lot of experience with Alibaba.com , i suggest you to search products and suppliers on Alibaba.com combining usage of google. You can see,its price is around 339USD-399USD/Piece currently. Usually, you can save up to 15% regardless of warranty etc. Which means its price at a shopping mall or retailer shop will be around 399USD-469USD/Piece. You found this business really interesting, and you want to find a supplier in China. You can see www.swagtron.com ranked very good, and you also see this seller on Amazon, if you are buy this hoverboard for your own usage, you can buy from them directly on Amazon because they are very famous per google sourcing results. But if you are a importer or reseller, you know their price is not very competitive as they are big brand and from US, US labor cost is very high, and the other three sites abosultely from China and you can find out their company name easily by visiting their website. Then use these company name you have found out and sourcing on Alibaba.com, you can find out them easily, no need to send hundreds of emails and inquires to dump supplier you have never heard before.No it is time to bargaining with the three manufactures ( maybe 4 maybe 10 ,depends on you ), you can get fine hoverboard with really cheap price. Summary: Cheap sometimes means bad quality, some time not. Depends on how you source. On 13th August 2016, Ms. Zhang Jiachen, responsible for sales of Ninebot’s rebot products, attended the global artificial intelligence and robotics summit CCF-GAIR, participated in the “Robot Business Scene”roundtable forum. And she revealed that the “Xiaomi 9 balance scooter” has been sold out “nearly a million” in the past 10 months. 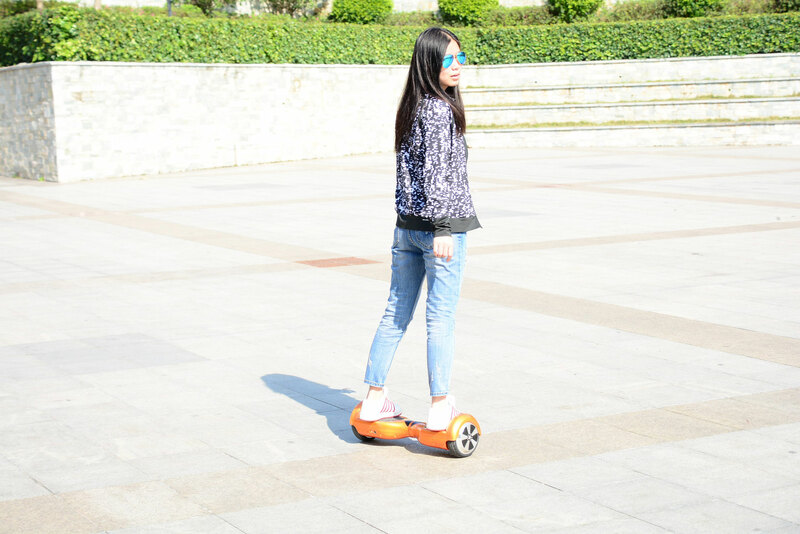 October 19, 2015, Xiao mi issued its Xiaomi 9 balance scooter, which is wholly knee controlled balance scooter. This balance wheel was manufactured by its partner-Nibebot Inc, who has fully owned Segway. Xiaomi 9 balance scooter adopts allinimum alloy as it frame material and 15 exclusive safety technology , wholly support self balancing two wheels by knee control, go forwards and back forwards up human’s gravity. Ninebot 9 balance scooter with a maximum speed of 16Km/H and driving mileage of 22km, its can easily climbing up a 15 degree slope. Its net weight about 12.5kg which makes it very easy to take it any where with you. Also, they have been prepared optional helmet, knee and wrist protector etc for more safety driving. Xiaomi 9 balance scooter is a prefect balance scooter for beginner. How to drive Xiaomi 9 balance scooter ? Similar to the body’s own balance system, when the body’s gravity forward,scooter need to move forward to keep balance, gravity backward and the scooter will move backward to keep balance. At the same time, the electric balance scooter steering through the adjustable handle, swing the handle and the two wheels produce speed difference (for example, swing the handle to the left, the right wheel speed will be faster than the left wheel )to achieve the effect of steering. Scooter powered by a battery pack, a full charge make sure 20-70km mileage ( depends on the battery capacity ) and maximum speed of 20km/h. When riding, make sure the steering handle face to the direction where we want to move forward, the scooter will move to the direction pointed. When the direction is in the middle of the scooter, the scooter will move straightly forward. When the steering worked, the scooter will control the left and right sides to get corresponding speed difference, and achieve steering effect.Make sure that the human body in the same direction of scooter and you will get a better steering experience. Breakthrough vertical steering design more in line with the body’s operating habits. 1.Before driving the electric balancing scooter, you need to check the smart balance wheel parts are installed firmly or not, make sure they are without any damage. 2.You need to find an open and flat space for practice, this space should be at least 4×4 meter area, indoor and outdoor can be ok.
3.You need to have a good understanding of the driving environment: to ensure that you will not be disturbed by cars, passersby, pets, bicycles and other obstacles. Author AdministratorPosted on May 17, 2015 Format ImageCategories Images Posts, Life StyleTags electric balancing scooter drive, how to drive balance scooter, how to drive hoverboard, how to drive smart balance wheelLeave a comment on How to drive Xiaomi 9 balance scooter ?